Giuseppe: Mussolini is not so clever like Hitler, he can dress his Italians up only to look like thieves, cheats, murderers, he cannot like Hitler, make them feel like that. He cannot, like Hitler, scrape from the conscience the knowledge that right is right and wrong is wrong, or dig holes in their heads to plant his own ten commandments: steal from thy neighbor, cheat thy neighbor, kill thy neighbor. Capt. von Schletow: You dare to insult the Führer? Giuseppe: That would take an artiste - I am but a mechanic. Opening credits prologue: In June, 1942, a small detachment of American tanks with American crews, joined the British Eighth Army in North Africa to get experience in desert warfare under actual battle conditions. Played on the harmonica by Patrick O'Moore. 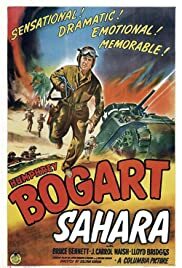 Assisting in the overall success of "Sahara" was a masterful musical score by Miklos Rozsa, who did similar duty the same year in another "tank" picture, Billy Wilder's "Five Graves to Cairo."